This article is about the American football player. For other uses, see Russell Wilson (disambiguation). Wilson played college football for the University of Wisconsin during the 2011 season, in which he set the single season FBS record for passing efficiency (191.8) and led the team to a Big Ten title and the 2012 Rose Bowl. Wilson played football and baseball for North Carolina State University from 2008 to 2010 before transferring to Wisconsin. Wilson also played minor league baseball for the Tri-City Dust Devils in 2010 and the Asheville Tourists in 2011 as a second baseman. Wilson was selected by the Seattle Seahawks with the 12th pick in the third round (75th overall) of the 2012 NFL Draft. In 2012 he tied Peyton Manning's record for most passing touchdowns by a rookie (26) and was named the Pepsi NFL Rookie of the Year. In 2013, he led the Seahawks to their first ever Super Bowl victory, and in 2014, led them to a second straight Super Bowl berth. Wilson has won more games (46) than any other NFL quarterback in his first four seasons, and is currently the second highest rated NFL passer of all time behind Aaron Rodgers. On July 31, 2015, Wilson signed a four-year, $87.6 million contract extension with the Seahawks, making him at the time the second highest paid player in the NFL. Wilson was born at The Christ Hospital in Cincinnati, Ohio, and grew up in Richmond, Virginia, the son of Harrison Benjamin Wilson III, a lawyer, and Tammy Wilson (née Turner), a legal nurse consultant. He has an older brother, Harrison IV, and a younger sister, Anna. Wilson started playing football with his father and brother at the age of four, and played his first organized game for the Tuckahoe Tomahawks youth football team in sixth grade. Wilson's great-great-grandfather was a slave to a Confederate colonel and was freed after the American Civil War. Wilson's paternal grandfather, Harrison B. Wilson Jr., is a former president of Norfolk State University who played football and basketball at Kentucky State University, and his paternal grandmother, Anna W. Wilson, was on the faculty at Jackson State University. Wilson's maternal grandfather was noted painter A. B. Jackson. According to genetic admixture analysis, Wilson is 62% African, 36% European, 1% West Asian, and 1% Central Asian. His family lineage has been traced back to 524 A.D. to Saint Arnulf of Metz. Wilson's father played football and baseball at Dartmouth and was a wide receiver for the San Diego Chargers preseason squad in 1980. Wilson's brother Harry played football and baseball at the University of Richmond, and his sister Anna plays basketball for Stanford. Wilson's father died on June 9, 2010 at age 55 due to complications from diabetes. Wilson attended Collegiate School, a preparatory school in Richmond, Virginia. As a junior in 2005, he threw for 3,287 yards and 40 touchdowns. He also rushed for 634 yards and 15 touchdowns. He was named an all-district, all-region, and all-state player. Wilson was twice named the Richmond Times-Dispatch Player of the Year. As a senior in 2006, he threw for 3,009 yards, 34 touchdowns, and seven interceptions. Wilson also rushed for 1,132 yards and 18 touchdowns. That year, he was named an all-conference and all-state player as well as conference player of the year. He was featured in Sports Illustrated magazine for his performance in the state championship game win. Wilson also served as his senior class president. In addition to playing football, Wilson was also a member of the Collegiate basketball and baseball teams. "2007 Team Ranking". Rivals.com. Retrieved October 7, 2011. Wilson committed to North Carolina State University on July 23, 2006. He also received a football scholarship offer from Duke University. Wilson redshirted during the 2007 season at NC State. In 2008, Wilson initially split time at quarterback with senior Daniel Evans and junior Harrison Beck. However, Evans and Beck saw no regular season action after Week 2 and Week 5, respectively. Thereafter, Wilson led the team to a 4–3 record in the regular season which NC State finished out on a four-game winning streak. During a win over East Carolina, Wilson threw for 201 yards and three touchdowns. He threw for two touchdowns in each of the last six season games. In the 2008 PapaJohns.com Bowl against Rutgers, Wilson threw for 186 yards and a touchdown and rushed for 46 yards before halftime. Late in the first half, he scrambled to the Rutgers' four-yard line, where he was tackled and suffered a knee sprain. With Wilson sitting out the remainder of the game, his replacements threw a combined total of three interceptions with NC State eventually losing, 23–29. Over the course of the season, he completed 150 of 275 attempts for 1,955 yards and 17 touchdowns with just one interception. He also recorded 116 carries for 394 yards and four touchdowns. The Atlantic Coast Conference (ACC) named him the first-team All-ACC quarterback. It was the first time in the conference's history that a freshman quarterback was named to the first team. Prior to the 2009 season, Wilson was named as the quarterback on the pre-season all-ACC football team on July 12. On September 19, Wilson broke Andre Woodson's all-time NCAA record of 325 consecutive pass attempts without an interception against Gardner-Webb. The 379-pass streak ended in a game against Wake Forest on October 3. Wilson held the record until November 10, 2012, when it was broken by Louisiana Tech quarterback Colby Cameron. Wilson led the 2010 Wolfpack to a 9–4 season that included a 23–7 win over West Virginia in the 2010 Champs Sports Bowl. He led the ACC in passing yards per game (274.1) and total offensive yards per game (307.5). Wilson graduated from NC State in three years in May 2010 with a BA in communication, and took graduate-level business courses in the fall semester during the 2010 football season. In January 2011, Wilson announced that he would report to spring training with the Colorado Rockies organization. NC State head coach Tom O'Brien expressed reservations with Wilson's decision, saying "Russell and I have had very open conversations about his responsibilities respective to baseball and football. While I am certainly respectful of Russell's dedication to baseball these last several years, within those discussions I also communicated to him the importance of his time commitment to NC State football." O'Brien and his staff reached out to NFL coaches and general managers on Wilson's behalf, but he failed to receive an invitation to the 2011 NFL Scouting Combine. On April 29, 2011, O'Brien announced that Wilson had been granted a release from his football scholarship with one year of eligibility remaining. On June 27, 2011, Wisconsin head coach Bret Bielema announced that Wilson had committed to Wisconsin for the 2011 season. In the season opener against UNLV, Wilson passed for 255 yards and 2 touchdowns in a 51–17 victory. He also rushed for 62 yards, including a 46-yard touchdown run. At the end of the regular season, Wilson was named first team All-Big Ten by both the coaches and media. Wilson also won the Griese-Brees Big Ten Quarterback of the Year award. In the inaugural Big Ten Championship Game on December 3, Wilson threw for 3 touchdowns and led the Badgers to a 42–39 win over the Michigan State Spartans. Wilson was named the game's Grange-Griffin MVP. In December 2011, Wilson was named a third team All-American by Yahoo Sports, and he finished ninth in the voting for the Heisman Trophy with 52 points. In the 2012 Rose Bowl vs. the Oregon Ducks on January 2, 2012, Wilson had 19 pass completions on 25 attempts for 296 yards, 18 rushing yards, and 3 touchdowns (2 passing, 1 rushing). The Badgers lost the game 38–45. Wilson finished the season with 33 passing touchdowns, which set the single season record at Wisconsin and was the second-most in Big Ten history behind Drew Brees during the 1998 season at Purdue (39). Wilson also set the single season FBS record for passing efficiency (191.8). On January 28, 2012, Wilson completed his college football career at the 2012 Senior Bowl. On January 16, 2012, Wilson began training for the NFL Scouting Combine at the IMG Madden Football Academy in Bradenton, Florida. Prior to the 2012 NFL Draft, Wilson had been projected by NFL scouts and analysts to be a middle-round pick. In February 2012, former NFL quarterback and director of the IMG Madden Football Academy Chris Weinke said of Wilson, "If he was 6–5, he'd probably be the No. 1 pick in the draft." On April 11, 2012, ESPN Monday Night Football analyst Jon Gruden said, "The only issue with Russell Wilson is his height. That might be the reason he's not picked in the first couple rounds." On April 27, 2012, Wilson was selected by the Seattle Seahawks in the third round (75th pick overall) of the draft. The Seahawks endured significant negative criticism for their 2012 draft, and for selecting Russell Wilson in particular as the Seahawks had just signed free agent Matt Flynn. Wilson signed a four-year, $2.99 million contract with the Seahawks on May 7, 2012. He made his preseason debut against the Tennessee Titans on August 11, 2012 and had his first preseason start on August 24 against the Kansas City Chiefs. On August 26, 2012, Wilson was named the starting quarterback for the first regular season game after competing with Matt Flynn and Tarvaris Jackson for the position. On September 9, 2012, Wilson made his regular season debut in a 20–16 loss to the Arizona Cardinals. Wilson threw 18 completions on 34 attempts for 153 yards, 1 touchdown and 1 interception. In the third regular season game against the Green Bay Packers, the Seahawks won 14–12 on a controversial hail mary touchdown pass to Golden Tate. The contentious nature of the replacement officials' decision on the play was widely considered to have been the tipping point that led to an agreement being reached to end the 2012 NFL referee lockout. Wilson earned the Pepsi NFL Rookie of the Week honors for his stellar week 10 performance in a 28–7 victory over the New York Jets. He threw 12 completions on 19 attempts for 188 yards and 2 touchdowns, along with 7 rushing attempts for 34 yards. Wilson was named NFC Offensive Player of the Week and FedEx Air Player of the Week for his week 13 performance in the 23–17 Seahawks win over the Chicago Bears. He earned NFL Offensive Rookie of the Month honors for December 2012 after the Seahawks went 5–0 and Wilson achieved a passer rating of 115.2. Wilson finished the 2012 regular season ranked 4th in the NFL in passer rating (100.0), beating the previous rookie record set by Ben Roethlisberger in 2004 (98.1). He threw for 3,118 yards and 26 touchdowns, tying Peyton Manning's record for most touchdowns thrown by a rookie, and rushed for 489 yards and four touchdowns. Wilson's scrambling mobility and ability to extend plays outside the pocket with his legs earned numerous comparisons to Hall of Fame quarterback Fran Tarkenton. 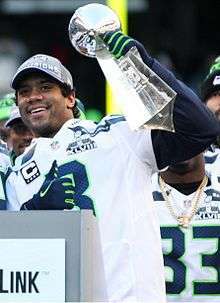 Wilson led the Seahawks to the postseason in his rookie year. He made his postseason debut in the NFC Wild Card Round against the Washington Redskins, passing for 187 yards and rushing for 67 yards as the Seahawks rallied for a 24–14 comeback victory over the Redskins. During the divisional round against the Atlanta Falcons, Wilson threw for 385 yards and rushed for 60 yards but the Seahawks lost the game 28–30. Wilson was selected as an alternate for the 2013 Pro Bowl, filling in for Matt Ryan. At the Pro Bowl, Wilson threw 8 completions on 10 attempts for 98 yards, 3 touchdowns, and no interceptions for a 147.1 rating. At the end of the season, Wilson earned a bonus of $222,000 through the NFL's Performance-Based Pay program. Wilson's Seahawks opened the 2013 season with the first 4–0 start in franchise history, after which they lost to the Colts in week 5. The Seahawks then went on a 7-game winning streak, culminating in a 34–7 victory over the Saints in Week 13 in which Wilson threw 3 touchdown passes and earned his second NFC Offensive Player of the Week award. Over the next 3 weeks the Seahawks would suffer 2 divisional losses to the 49ers and Cardinals (the loss to the Cardinals represented Wilson's first home loss as QB for the Seahawks), but defeated the Rams in Week 17 to finish the season with a 13–3 record, the NFC West title, and the No. 1 seed in the playoffs. Wilson finished the season with 26 touchdown passes, 9 interceptions, and a 101.2 passer rating, becoming the first quarterback in the Super Bowl era to post a 100+ passer rating in each of his first 2 seasons. Wilson was named to his second Pro Bowl on December 27, 2013. On January 19, 2014, Wilson and the Seahawks defeated the San Francisco 49ers in the NFC Championship Game, 23–17, sending the Seahawks to Super Bowl XLVIII. Wilson threw for 206 yards, 2 touchdowns, and no interceptions for a 123.1 passer rating in the 43–8 defeat over the Denver Broncos. With the victory, Wilson became just the second black starting quarterback to win a Super Bowl, joining Super Bowl XXII winner Doug Williams. In addition to this, Wilson, at 5'11" tall, became the shortest quarterback to win a Super Bowl, shorter than Len Dawson, Joe Theismann, and Drew Brees (all 6'0"). Wilson earned a bonus of $169,141.73 for the 2013 season through the NFL's Performance-Based Pay program. On September 21, 2014, Russell Wilson led the Seahawks on an 80-yard touchdown drive in overtime to defeat the Denver Broncos, 26–20, in a Week 3 rematch of the previous season's Super Bowl. On October 6, 2014, against the Washington Redskins, Wilson set a new Monday Night Football record for rushing yards by a quarterback in a single game with 122. The Seahawks clinched a playoff spot in Week 16 when the Dallas Cowboys defeated the Indianapolis Colts 42–7, eliminating the Philadelphia Eagles from postseason contention and allowing the Seahawks to clinch before their Sunday Night matchup. On December 21, 2014, Russell Wilson went 20/31 and threw for 339 yards with 2 touchdown passes and a rushing touchdown against the Cardinals in a primetime matchup on Sunday Night Football. The 339 passing yards is a career high for a regular season game. Wilson also led the offense in gaining 596 yards, setting a franchise record for most yards gained in a game. The Cardinals had the third best scoring defense heading into Week 16. The Seahawks won 35–6 as they snapped the Cardinals' 7 game home winning streak and regained 1st place in the NFC West as well as the NFC's #1 seed. The Seahawks defeated the Rams 20–6 in Week 17 to clinch the NFC West and the #1 seed for the second consecutive season, securing homefield advantage for the entirety of the NFC playoffs. Wilson led the Seahawks to a 31–17 home win over the Carolina Panthers in the Divisional round, making the Seahawks the first defending Super Bowl Champion to win a playoff game since the 2005 Patriots. The Seahawks hosted the Green Bay Packers in their second consecutive NFC Championship game. Wilson threw 3 first half interceptions while completing only 2 passes to his own team as the Seahawks fell behind 16–0 at halftime. With the Packers leading 19–7 and 5 minutes remaining in the 4th quarter, Wilson threw his 4th interception. From that point onward, Wilson would lead the Seahawks on an improbable comeback. On the Seahawks' next drive, Wilson ran the ball in for a touchdown to cut the deficit to 19–14. After a successful onside kick recovery, Wilson led the Seahawks down the field, and Lynch ran in to give the Seahawks a 20–19 lead. Wilson completed a 15-yard 2 point conversion pass to Luke Wilson to make it 22–19 Seahawks. The Packers tied it up at the end of regulation and forced overtime. The Seahawks won the coin toss, and the offense took the field. Wilson led the Seahawks on an 80-yard drive that was capped by a 35-yard game winning touchdown pass to Kearse. The Seahawks completed their largest postseason comeback in franchise history as they clinched a Super Bowl berth. The Seahawks became the first defending champion to return to the Super Bowl since the 2004 Patriots. They faced the New England Patriots in Super Bowl XLIX, where they were defeated by a final score of 28–24. Although the Seahawks led 24–14 heading into the fourth quarter, the Patriots scored two consecutive touchdowns as they took a four-point lead with 2:02 remaining. Wilson led the Seahawks to the Patriots' one-yard line with 25 seconds remaining, but Patriots cornerback Malcolm Butler intercepted a pass intended for Ricardo Lockette, sealing the victory for the Patriots. On July 31, 2015, the Seahawks and Wilson agreed to a 4-year, $87.6 million contract extension. In the first 9 games of the season, Wilson threw 10 touchdown passes and 7 interceptions. Over the next 5 games, Wilson threw 19 touchdowns and no interceptions, becoming the only quarterback in NFL history to throw 3+ touchdown passes and no interceptions in 5 consecutive games. After a 2–4 start to the season, Wilson led the Seahawks to win 7 of their next 8 games and clinch a 4th consecutive playoff appearance in their week 15 win over the Cleveland Browns. His strong performance over the second half of the season, even after losing star running back Marshawn Lynch and tight end Jimmy Graham, led many analysts to consider Wilson an MVP candidate. Wilson broke numerous Seahawks single season passing records in 2015, including most passing yards (4,024), most passing touchdowns (34) and highest passer rating (110.1). He became the first Seahawks quarterback to throw for over 4,000 yards in a season, and finished the year with the highest passer rating in the NFL. On December 22, 2015, Wilson was named to his third Pro Bowl. The Seahawks traveled to Minnesota to face the Vikings in the NFC Wild Card playoff round. The temperature at kickoff was -6°F (-25°F wind chill), making it the third coldest game in NFL history. Wilson struggled in the sub-zero temperatures, throwing for 142 yards, one touchdown, and one interception. The Vikings missed a short field goal in the last minute, allowing the Seahawks to advance to the Divisional playoff round to face the 15–1 Carolina Panthers. Down 31-0 at the half, Wilson helped lead a furious comeback attempt, but the Panthers won 31–24, denying Wilson and the Seahawks their third consecutive Super Bowl appearance. Wilson in that game threw for 366 yards, three touchdowns, and two interceptions. Wilson was drafted first overall by Team Irvin in the 2016 Pro Bowl draft, and in the game threw 8 completions on 12 attempts for 164 yards, 3 touchdowns, and no interceptions for a 149.3 rating. He was named the Pro Bowl offensive MVP. First and the only quarterback in NFL history to have 4,000+ passing yards, 30+ passing touchdowns, and 500+ rushing yards in the same season (2015). After graduating from high school, Wilson was selected by the Baltimore Orioles with the fifth pick in the 41st round (1,222nd overall) of the 2007 MLB Draft. The Orioles considered Wilson a talent worthy of the first ten rounds, offered Wilson a $350,000 signing bonus, the third-largest they offered a draftee that year after Matt Wieters ($6 million) and Jake Arrieta ($1.1 million). Wilson instead elected to attend NC State that fall. In a 2008 interview Wilson said, "I was leaning towards [entering the draft], but a college education is something you'll always have." Wilson was a member of the NC State Wolfpack baseball team from 2008–2010, and in the summer of 2009 played for the Gastonia Grizzlies, a collegiate summer baseball team in the Coastal Plain League. He hit .282/.384/.415 with five home runs and 30 runs batted in (RBIs) during his career. On June 8, 2010, Wilson was drafted by the Colorado Rockies in the fourth round (140th pick overall) of the 2010 MLB Draft. That summer he played 32 games as a second baseman for the Tri-City Dust Devils, the Class A Short Season affiliate of the Rockies in the Northwest League. He finished the season with 2 home runs, 11 RBIs, and a .230 batting average. In the summer of 2011, Wilson played 61 games with the Asheville Tourists, the Class A affiliate of the Colorado Rockies in the South Atlantic League. He had 3 home runs, 15 RBIs, and a .228 batting average. In January 2012, Wilson informed the Rockies that he would be pursuing a career in the NFL and would not report to spring training for the 2012 season. On December 12, 2013, Wilson was acquired from the Rockies by the Texas Rangers in the Triple-A phase of the Rule 5 draft. Wilson attended Rangers spring training in Surprise, Arizona in 2014 and 2015. On April 26, 2012, Wilson announced he had chosen French/West/Vaughan as his marketing, public relations and endorsements agency. Since being named the starting quarterback of the Seahawks in August 2012, Wilson has appeared in advertisements for Levi's, American Family Insurance, Pepsi, Nike, Alaska Airlines, Microsoft, Duracell, Braun, Bose, United Way, and Larson Automotive Group. In 2014 Wilson became part-owner and endorser of Eat the Ball, a European bread company. In 2015 he began endorsing Luvo, a frozen food company, and Reliant Recovery Water. On February 29, 2016, Wilson launched Good Man Brand, a clothing line which he co-founded. In August 2016, it was announced that Wilson had partnered with Juice Press to open the company's first Seattle franchise. On November 14, 2016 Wilson announced he had joined Chris Hansen, Wally Walker, and Erik and Pete Nordstrom as partners in the investment group working to bring a new sports arena to Seattle's SoDo neighborhood for potential NBA and NHL teams. Wilson has appeared on the cover of several magazines including Sports Illustrated, Sports Illustrated Kids, Rolling Stone, ESPN The Magazine, Men's Fitness, and Men's Health. "It's payback, Russell Wilson falling way back / In the draft, turn nothing into something, still can make that / Straw into gold chump, I will spin Rumpelstiltskin in a haystack"
Wilson has appeared on Late Show with David Letterman, Jimmy Kimmel Live!, Late Night with Seth Meyers, Charlie Rose, and in the 2015 film Entourage. He also hosted the 2015 Kids' Choice Sports Awards on Nickelodeon on July 16, 2015. Wilson was the keynote speaker for the 2016 commencement ceremony at the University of Wisconsin - Madison. Wilson is married to singer/songwriter, Ciara. They began dating in early 2015 and announced their engagement on March 11, 2016. They were married on July 6, 2016, at the Peckforton Castle in Cheshire, England. They reside in Bellevue, Washington with their two Great Danes, Prince and Naomi. On October 25, 2016, they announced they were expecting their first child. Wilson was previously married to Ashton Meem from January 2012 to April 2014. Wilson is a devout Christian. His net worth as of October 2016 is $120 million. Wilson is an active volunteer in the Seattle community. During the NFL season, Wilson makes weekly visits on his days off to the Seattle Children's Hospital, and has also visited with soldiers at Joint Base Lewis-McChord. In the offseason, Wilson hosts the Russell Wilson Passing Academy, a youth football camp, in several cities. In 2012, proceeds from the camp went to the Charles Ray III Diabetes Association, for which Wilson is the National Ambassador. 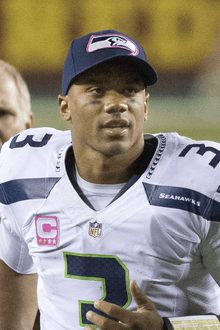 In 2013 and 2014, Wilson partnered with Russell Investments for its "Invested with Russell" program, which donated $3,000 to Wilson's charitable foundation for every touchdown he scored. Wilson co-hosts an annual charity golf event along with NASCAR driver Kasey Kahne at Suncadia Resort in Cle Elum, Washington to support various organizations including Boys & Girls Clubs of America and Seattle Children's Hospital. In August 2016, Wilson's Why Not You Foundation presented a check for $1,060,005 to Seattle Children's Hospital for its Strong Against Cancer initiative. 1 2 "Russell Wilson named 2012 NFL Rookie of the Year". Seahawks.com. March 29, 2013. Retrieved April 3, 2013. ↑ Elsayed, Khaled. "2012 PFF Rookies of the Year". Pro Football Focus. Retrieved December 3, 2013. 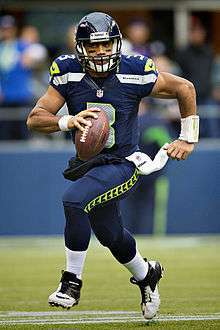 ↑ "Russell Wilson | Seattle Seahawks | Stats, Pictures, News | NFL Football | FOX Sports on MSN". Msn.foxsports.com. Retrieved August 16, 2014. ↑ Aug 15Final (November 29, 1988). "Russell Wilson Stats, News, Videos, Highlights, Pictures, Bio - Seattle Seahawks - ESPN". Espn.go.com. Retrieved August 16, 2014. ↑ Pete Thamel (January 11, 2012). "Wisconsin Quarterback Opts for Football Career". The New York Times. Retrieved August 29, 2012. 1 2 3 "Russell Wilson Stats, Bio, Photos, Highlights – Asheville Tourists". MiLB.com. Retrieved August 29, 2012. ↑ Scott Coleman (April 27, 2012). "NFL Draft Results 2012: Seahawks Select Russell Wilson With 75th Pick of 3rd Round". SB Nation. Retrieved August 29, 2012. ↑ "Player Season Finder Query Results". Pro-Football-Reference.com. Retrieved February 7, 2016. ↑ "NFL Career Passer Rating Leaders - Pro-Football-Reference.com". Pro-Football-Reference.com. Retrieved February 7, 2016. ↑ The Sports Xchange (July 31, 2015). "Seattle's Russell Wilson now second highest paid player in NFL". Albany Herald. Retrieved February 7, 2016. ↑ "Russell Wilson's unique homecoming". Cincinnati.com. October 7, 2015. Retrieved February 7, 2016. 1 2 "Late father's lessons still resonate with Badgers' Wilson : Sports". Host.madison.com. August 29, 2011. Retrieved January 19, 2013. ↑ "About Us – Tammy Wilson Legal Nurse Consulting, LLC". Tammywilsonlegalrnconsult.com. Retrieved January 19, 2013. ↑ "Wilson has high expectations of his own in move to Madison – UWBadgers.com – The Official Web Site of the Wisconsin Badgers". Uwbadgers.com. June 27, 2011. Retrieved January 19, 2013. ↑ Tysiac, Ken (August 22, 2010). "Father's dream inspires Pack's Wilson – NC State –". Newsobserver.com. Retrieved January 19, 2013. ↑ "Seahawks players, coaches recount where they got their start playing football". October 23, 2015. 1 2 "Russell Wilson's NFL journey shows power of education". Richmond Times-Dispatch. October 12, 2012. Retrieved January 19, 2013. ↑ "Richard Arnold Wilson". tribunedigital-dailypress. Retrieved April 30, 2016. ↑ "Russell Wilson & Dr. Henry Louis Gates, Jr. at The Richmond Forum - Facebook". ↑ Russell Wilson with Dr. Henry Louis Gates, Jr. at The Richmond Forum. April 18, 2016. Retrieved April 18, 2016 – via YouTube. ↑ Doug Baldwin (February 21, 2013). "Fresh Files: Chef Baldwin cooking up some answers. (Special Guests)". YouTube. Retrieved April 3, 2013. ↑ Wilson, Russell (July 9, 2014). "From the Akron Pros to the Seattle Seahawks: Race and the NFL". mmqb.si.com. Retrieved June 22, 2015. ↑ Ryan Scheel (April 12, 2016). "QB Russell Wilson Is Descended From A Catholic Saint". uCatholic. Retrieved April 18, 2016. 1 2 Potrykus, Jeff (August 13, 2011). "Bond between Wilson and late dad cemented over time – JSOnline". Jsonline.com. Retrieved January 19, 2013. 1 2 "Wolfpack's Wilson living a dream as two-sport college athlete – College Sports – ESPN". Sports.espn.go.com. July 31, 2008. Retrieved January 19, 2013. ↑ O'Neil, Danny. "Russell Wilson's rise to NFL starter no surprise for those who know him | Seahawks". The Seattle Times. Retrieved January 19, 2013. ↑ "Seattle quarterback Russell Wilson's sister signs with Stanford". November 11, 2015. Retrieved February 7, 2016. ↑ "Stanford signee Anna Wilson discusses how big brother Russell has influenced her". March 28, 2016. 1 2 Russell Wilson, NC State University Wolfpack Official Athletic Site, retrieved January 18, 2009. ↑ O'Neil, Danny. "Russell Wilson defied all odds to become the talk of the NFL | Seahawks". The Seattle Times. Retrieved January 19, 2013. 1 2 Arlene Hamilton Stewart. "I Do, I Do: Ashton Meem + Russell Wilson". Richmond Times-Dispatch. Retrieved January 19, 2013. ↑ "Russell Wilson". Rivals.com. Retrieved October 7, 2011. ↑ "Russell Wilson". Scout.com. Retrieved October 7, 2011. 1 2 Russell Wilson Stats, ESPN, retrieved January 18, 2009. ↑ Ken Tysiac, Wolfpack bows out in Papajohns.com Bowl, Charlotte Observer, December 30, 2008, retrieved January 18, 2009. ↑ Atlantic Coast Sports Media Association Announces 2008 All-ACC Football Teams, Atlantic Coast Conference, December 1, 2008, retrieved January 18, 2009. ↑ "NC State vs. Wake Forest - Recap - October 3, 2009 - College Football - SI.com". Sportsillustrated.cnn.com. Retrieved January 19, 2013. ↑ Myerberg, Paul (November 10, 2012). "Louisiana Tech QB Colby Cameron sets NCAA record". Usatoday.com. Retrieved April 3, 2013. ↑ "North Carolina State University Department of Communication Graduation Ceremony Program, May 15, 2010 - ncsu.edu" (PDF). Retrieved January 19, 2013. ↑ Matt CarterTheWolfpacker.com Editor (August 25, 2010). 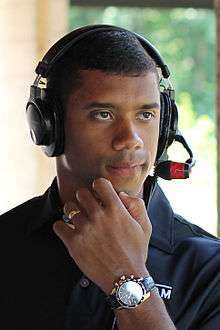 "TheWolfpacker.com – Russell Wilson ready for 2010 campaign". Ncstate.rivals.com. Retrieved January 19, 2013. ↑ "Russell Wilson out of Tom O'Brien's mindset – NC State". NewsObserver.com. July 22, 2011. Retrieved January 19, 2013. ↑ "QB Wilson's career at NC State is over". WRALSportsFan.com. Retrieved January 19, 2013. ↑ Marlon A. Walker (April 28, 2011). "Three-Way Threat: Russell Wilson". Diverse: Issues In Higher Education. Retrieved August 29, 2012. ↑ "N.C. State QB Russell Wilson will leave school for spring training". The Rocky Mount Telegram. Associated Press. January 17, 2011. Retrieved August 30, 2012. ↑ Jenks, Jayson. "Russell Wilson, Seahawks carry great expectations in 2013 | Sports Pages". The Seattle Times. Retrieved December 3, 2013. ↑ "NC State grants quarterback Russell Wilson release". Sports.espn.go.com. April 29, 2011. Retrieved January 19, 2013. ↑ "Wilson commits to Wisconsin – UWBadgers.com – The Official Web Site of The Wisconsin Badgers Athletics". UWBadgers.com. Retrieved January 19, 2013. ↑ Greenstein, Teddy (December 9, 2011). "Wisconsin's Ball wins Tribune's Silver Football – Chicago Tribune". Articles.chicagotribune.com. Retrieved January 19, 2013. ↑ "Yahoo Sports All-America Team". Rivals.yahoo.com. December 8, 2011. Retrieved January 19, 2013. ↑ "2011 Heisman Trophy Final Voting". Heismanpundit.com. Retrieved January 19, 2013. ↑ "Wisconsin Badgers vs. Oregon Ducks – Box Score". Scores.espn.go.com. January 2, 2012. Retrieved January 19, 2013. ↑ "The Official Web Site of The Wisconsin Badgers Athletics – Football". Uwbadgers.Com. Retrieved January 19, 2013. ↑ "2011 NCAA Division I-A College Football Individual Statistics Leaders for Passing". Espn.go.com. Retrieved January 19, 2013. 1 2 Yasinskas, Pat. "Russell Wilson ready for big combine – NFC South Blog". Espn.go.com. Retrieved January 19, 2013. ↑ "IMG Academy 2012 NFL Combine Training Program in full swing". Retrieved March 25, 2013. ↑ "Rating the NFL draft prospects: Quarterbacks". Retrieved April 30, 2016. ↑ "Wilson NFL Combine". Nfl.com. Retrieved January 19, 2013. ↑ "UW football: Outlook good for these ex-Badgers in NFL draft : Sports". Host.madison.com. April 25, 2012. Retrieved January 19, 2013. ↑ Archived June 8, 2012, at the Wayback Machine. ↑ Stephen Rodrick (August 26, 2015). "Russell Wilson: The Chosen One". Rolling Stone. Retrieved August 27, 2015. ↑ Will Brinson (February 6, 2014). "Russell Wilson remembers people ripping Seahawks' 2012 draft class". CBS Sports. Retrieved March 11, 2015. ↑ "Russell Wilson Contract, Salaries, and Transactions". Spotrac.com. Retrieved January 19, 2013. ↑ "Russell Wilson steals show in Seahawks win over Titans –". Usatoday.com. August 12, 2012. Retrieved January 19, 2013. ↑ "Russell Wilson named starting QB by Seattle Seahawks –". Nfl.com. Retrieved January 19, 2013. ↑ O'Neil, Danny. "Touchdown call on last throw sends Seahawks to 14–12 Monday night victory | Seahawks". The Seattle Times. Retrieved January 19, 2013. ↑ "NFL, referees end lockout after reaching new labor deal –". Usatoday.com. September 27, 2012. Retrieved January 19, 2013. ↑ "NFL Referees agree deal with league to end lockout". Reuters. September 27, 2012. Retrieved January 19, 2013. ↑ Drovetto, Tony (November 16, 2012). "Russell Wilson voted Week 10 Rookie of the Week". Seahawks.com. Retrieved November 17, 2012. 1 2 Farnsworth, Clare (December 7, 2012). "Seahawks.com Blog | Wilson named FedEx Air Player of the Week". Blog.seahawks.com. Retrieved January 19, 2013. 1 2 "Russell Wilson named NFL Offensive Rookie of the Month for December | Seattle Seahawks & NFL News - seattlepi.com". Blog.seattlepi.com. January 3, 2013. Retrieved January 19, 2013. ↑ "Seattle Seahawks' Russell Wilson ties Peyton Manning's rookie TD pass record". December 30, 2012. Retrieved December 31, 2012. ↑ "Athletic Seahawks QB Russell Wilson a challenge for Miami Dolphins' defense". The Miami Herald. November 23, 2012. Retrieved March 2, 2013. ↑ "Fran Tarkenton, the original scrambling quarterback". fieldgulls.com. February 16, 2013. Retrieved March 2, 2013. ↑ Farnsworth, Clare (January 12, 2013). "Fran Tarkenton: 'Russell Wilson is Rookie of the Year'". Seahawks.com. Retrieved January 13, 2016. ↑ "Seattle Seahawks vs. Atlanta Falcons". ESPN. Retrieved January 15, 2013. ↑ Sando, Mike. "Daryl Washington, Russell Wilson worthy of Pro Bowl – ESPN". Espn.go.com. Retrieved January 31, 2013. ↑ "AFC All-Stars vs. NFC All-Stars – Box Score – January 27, 2013 – ESPN". Scores.espn.go.com. January 27, 2013. Retrieved January 31, 2013. ↑ O'Neil, Danny (March 12, 2013). "Russell Wilson gets a big ol' bonus | Seahawks Blog | Seattle Times". Blogs.seattletimes.com. Retrieved April 3, 2013. ↑ "Vontaze Burfict earns top figure in 'Performance-Based Pay'". NFL.com. March 20, 2013. Retrieved April 3, 2013. ↑ Condotta, Bob. "Seahawks suffer first loss, 34–28, to Colts | Seahawks". The Seattle Times. Retrieved January 23, 2014. ↑ Tony Drovetto (December 4, 2013). "Wednesday Round-Up: Russell Wilson earns NFC Offensive Player of Week 13". Seahawks.com. Retrieved January 23, 2014. ↑ Dybas, Todd (December 28, 2013). "Russell Wilson among 6 Seahawks selected for Pro Bowl | Seattle Seahawks". The Olympian. Retrieved January 23, 2014. ↑ "San Francisco 49ers vs. Seattle Seahawks – Recap – January 19, 2014 – ESPN". Scores.espn.go.com. January 19, 2014. Retrieved January 23, 2014. ↑ "Seahawks crush Broncos for first Super Bowl win". Nfl.com. Retrieved February 2, 2014. ↑ Rogers, Dexter. "Russell Wilson Becomes Second African-American QB to Win Super Bowl". Huffington Post. ↑ Jones, Mike (October 7, 2014). "The Redskins put up a fight, but Seahawks, behind Russell Wilson, prevail, 27-17". The Washington Post. Retrieved October 7, 2014. ↑ "Quarterback Russell Wilson agrees to extension with Seattle Seahawks". ESPN.com. Retrieved February 7, 2016. ↑ "Player Streak Finder - Game streak of 3 passing TD with no INT". Pro-Football-Reference.com. Sports Reference LLC. Retrieved June 21, 2016. ↑ "Seahawks clinch playoff spot with win over Browns". NFL.com. Retrieved February 7, 2016. ↑ Barnwell, Bill (December 14, 2015). "He won't win MVP, but nobody is outplaying Russell Wilson". 'ESPN'. Retrieved January 3, 2016. ↑ Kapadia, Sheil (January 3, 2016). "Russell Wilson sets single-season team marks for passing yards, TD throws". 'ESPN'. Retrieved January 3, 2016. ↑ Kapadia, Sheil (January 3, 2016). "Seahawks' Russell Wilson passes 4,000 yards, breaks Seattle franchise records for TD throws, passing yards". 'The Seattle Times'. Retrieved January 3, 2016. ↑ "NFL Player Passing Statistics - 2015". 'ESPN'. Retrieved January 3, 2016. ↑ "2016 Pro Bowl roster". NFL.com. Retrieved February 7, 2016. ↑ "Cold, hard fact: Seahawks-Vikings is third-coldest game in NFL history". CBSSports.com. Retrieved April 18, 2016. ↑ "Seattle at Carolina - 2016-01-17 - National Football League - Yahoo! Sports". Yahoo Sports. Retrieved February 7, 2016. ↑ "Russell Wilson, Eli Manning top picks in 2016 Pro Bowl draft". ESPN.com. Retrieved February 7, 2016. ↑ "Rice vs. Irvin - Box Score - January 31, 2016 - ESPN". ESPN.com. Retrieved February 7, 2016. ↑ "Seahawks' Russell Wilson named Offensive MVP of Pro Bowl, and Michael Bennett Defensive MVP, as Team Irvin beats Team Rice". The Seattle Times. January 31, 2016. Retrieved February 7, 2016. ↑ "Appearances on Leader Boards, Awards, and Honors". pro-football-reference.com. Retrieved February 4, 2016. ↑ "RUSSELL WILSON VOTED WEEK 10 ROOKIE OF THE WEEK". seahawks.com. November 16, 2012. Retrieved February 4, 2016. ↑ "Seahawks QB Russell Wilson Named Steve Largent Award Winner". seahawks.com. December 30, 2012. Retrieved February 4, 2016. 1 2 "Russell Wilson - Seahawks". www.seahawks.com. Retrieved September 26, 2015. ↑ "Best touchdown pass–interception differential, rookie season". pro-football-reference.com. Retrieved October 5, 2015. ↑ "Russell Wilson sets record for postseason passing yards by a rookie". Profootballtalk.nbcsports.com. Retrieved January 23, 2014. ↑ Terry Blount (December 16, 2013). "Seattle Seahawks' Russell Wilson Continues to Set Records". [ESPN]. Retrieved December 16, 2013. ↑ "Most regular season wins by QB in first 2 seasons". pro-football-reference.com. Retrieved October 6, 2016. ↑ "Most regular season wins by QB in first 3 seasons". pro-football-reference.com. Retrieved October 6, 2016. ↑ "Most regular season wins by QB in first 4 seasons". pro-football-reference.com. Retrieved October 6, 2016. ↑ "300 passing yard & 100 rushing yard". pro-football-reference.com. Retrieved September 29, 2015. ↑ "Most games 1+ passing TD's, season". pro-football-reference.com. Retrieved January 11, 2016. ↑ "Most consecutive games 3+ TD passes & no INT". pro-football-reference.com. Retrieved December 21, 2015. ↑ "NFL Career Passer Rating Leaders". pro-football-reference.com. Retrieved January 4, 2016. ↑ "First in NFL 3+ passing TD's and no INT in 5 consecutive games". pro-football-reference.com. Retrieved February 4, 2016. ↑ "First in NFL passer rating 128.3+ in 5 consecutive games". pro-football-reference.com. Retrieved February 4, 2016. ↑ "Seahawks dominate Cardinals in statement game". nflcom. Retrieved January 4, 2016. ↑ "First in NFL season 4,000+ passing yards, 30 passing TD's, 500 rushing yards". pro-football-reference.com. Retrieved February 4, 2016. ↑ "Highest passer rating, career Seahawks". pro-football-reference.com. Retrieved January 3, 2016. ↑ "Highest passer rating, season Seahawks". pro-football-reference.com. Retrieved January 3, 2016. ↑ "Highest passer rating,rookie season Seahawks". pro-football-reference.com. Retrieved December 4, 2015. ↑ "Highest completion percentage, career Seahawks". pro-football-reference.com. Retrieved December 21, 2015. ↑ "Highest completion percentage, season Seahawks". pro-football-reference.com. Retrieved January 3, 2016. ↑ "Highest completion percentage, rookie season Seahawks". pro-football-reference.com. Retrieved December 4, 2015. ↑ "Highest yards per attempt, career Seahawks". pro-football-reference.com. Retrieved December 21, 2015. ↑ "Highest yards per attempt, rookie season Seahawks". pro-football-reference.com. Retrieved December 4, 2015. ↑ "Lowest percentage passes had intercepted, career Seahawks". pro-football-reference.com. Retrieved December 21, 2015. ↑ "Lowest percentage passes had intercepted, rookie season Seahawks". pro-football-reference.com. Retrieved December 4, 2015. ↑ "Most rushing yards by a QB, career Seahawks". pro-football-reference.com. Retrieved January 4, 2016. ↑ "Most rushing yards by a QB, season Seahawks". pro-football-reference.com. Retrieved December 10, 2015. ↑ "Most rushing yards by a QB, rookie season Seahawks". pro-football-reference.com. Retrieved January 4, 2016. ↑ "Highest yard rushing average, career Seahawks". pro-football-reference.com. Retrieved December 23, 2015. ↑ "Highest yard rushing average, season Seahawks". pro-football-reference.com. Retrieved January 5, 2016. ↑ "Most wins at quarterback, season Seahawks". pro-football-reference.com. Retrieved November 24, 2015. 1 2 "Most Passing Yards, season". pro-football-reference.com. Retrieved February 4, 2016. ↑ "Most passing yards, rookie season Seahawks". pro-football-reference.com. Retrieved December 4, 2015. ↑ "Most passing touchdowns, season Seahawks". pro-football-reference.com. Retrieved January 3, 2016. ↑ "Most passing touchdowns, rookie season Seahawks". pro-football-reference.com. Retrieved December 4, 2015. ↑ "Most passing touchdowns, game Seahawks". pro-football-reference.com. Retrieved December 4, 2015. ↑ "Most games 1+ passing TD's, season Seahawks". pro-football-reference.com. Retrieved January 11, 2016. ↑ "Most Games 3+ TD, season Seahawks". pro-football-reference.com. Retrieved January 4, 2016. ↑ "Most Games 5+ TD, season Seahawks". pro-football-reference.com. Retrieved December 14, 2015. ↑ "2007 MLB Draft Results Round 41 | MLB Draft Results | 2007 MLB Amateur Draft Picks". Mymlbdraft.com. Retrieved January 19, 2013. ↑ "Steve Melewski: Looking back at when a Super Bowl-winning QB was an O's draft pick (with Alvarez note)". MASNsports. Retrieved February 7, 2016. ↑ "NC State University Official Athletic Site – North Carolina State University". Gopack.com. Retrieved January 19, 2013. ↑ Hall, Tim (June 3, 2009). "Wilson's good start with Gastonia Grizzlies". WRALSportsFan.com. Retrieved December 3, 2013. ↑ "2010 MLB Draft Results Round 4 - MLB Draft Results - 2010 MLB Amateur Draft Picks". Retrieved February 7, 2016. ↑ "Rockies draft pick chooses football instead | Sports – WTAE Home". Wtae.com. January 12, 2012. Retrieved January 19, 2013. ↑ "Russell Wilson to pursue football, won't report to Colorado Rockies spring training". Espn.go.com. January 12, 2012. Retrieved January 19, 2013. ↑ "Rangers pick NFL QB Russell Wilson in Rule 5 Draft | MLB.com: News". Mlb.mlb.com. Retrieved January 23, 2014. ↑ Durrett, Richard. "Russell Wilson: 'Never say never'". Retrieved March 4, 2014. ↑ Brooke, Tyler. "Russell Wilson Hits Home Run During Rangers Batting Practice". Bleacher Report. Retrieved 16 August 2015. 1 2 Chris Shigas – Vice President (April 26, 2012). "Former NC State and Wisconsin Star Quarterback Russell Wilson Engages French/West/Vaughan – French | West | Vaughan". Fwv-us.com. Retrieved January 19, 2013. ↑ "Twitter / DangeRussWilson: Just finished a shoot with". Twitter.com. Retrieved January 19, 2013. ↑ "Seahawks QB Russell Wilson stars in new Levi's ad – Blog". MyNorthwest.com. Retrieved January 19, 2013. ↑ "American Family Insurance". Amfam.com. Retrieved January 31, 2013. ↑ Rivedal, Karen (January 30, 2014). "Russell Wilson starring solo in Super Bowl ad for American Family : Sports". Host.madison.com. Retrieved August 16, 2014. ↑ "Kevin Durant of Oklahoma City Thunder, J.J. Watt of Houston Texans sign with American Family Insurance". ESPN.com. Retrieved February 7, 2016. 1 2 "Russell Wilson set to cash in off the field, too". USA Today. October 9, 2014. ↑ "Alaska Airlines Welcomes Seattle Seahawks Quarterback Russell Wilson to the Team – SEATTLE, Dec. 17, 2013 /PRNewswire/". Prnewswire.com. Retrieved January 23, 2014. ↑ Soper, Taylor. "Meet Microsoft's newest Surface spokesman: Super Bowl champion Russell Wilson". GeekWire. Retrieved August 16, 2014. ↑ "Russell Wilson has a new Duracell commercial (Video)". Pro Football Zone. July 28, 2014. Retrieved August 16, 2014. ↑ "Russell Wilson Announced as New Braun Spokesperson; Grooming Brand Unveils Its Campaign to Inspire Men to #FaceGreatness with Braun Confidence". Business Wire. August 7, 2014. Retrieved August 16, 2014. ↑ "Want to play like Seahawks quarterback Russell Wilson? Start with his playlist". Biz Journals. September 4, 2014. Retrieved September 4, 2014. ↑ "FTW Exclusive: Russell Wilson gives excellent advice in new NFL-United Way Play 60 commercial". USA Today. ↑ "Seahawks Quarterback Russell Wilson, is the New Spokesperson for Larson Automotive Group". Prweb.com. September 14, 2013. Retrieved December 3, 2013. ↑ "Darren Rovell on Twitter". Twitter. Retrieved February 7, 2016. ↑ "Russell Wilson: The Chosen One". Rolling Stone. Retrieved February 7, 2016. ↑ Arnold, Geoffrey (February 29, 2016). "Russell Wilson creates brand and proceeds go to charity". OregonLive. Retrieved February 29, 2016. ↑ Press, Juice. "Juice Press Partners With Super Bowl Champion Russell Wilson to Open Premiere Flagship Store in Seattle". ↑ TEGNA. "Russell Wilson joins SODO arena group". ↑ Eagle, Ben (August 28, 2013). "Colin Kaepernick, Andrew Luck, Robert Griffin III, Russell Wilson on Sept. 2 covers of SI - Audibles - SI.com". Nfl.si.com. Retrieved August 16, 2014. ↑ ScooAxson (August 27, 2014). "Russell Wilson, Colin Kaepernick on this week's Sports Illustrated cover". Retrieved February 7, 2016. ↑ "Twitter / SIKids: @DangeRussWilson We're pumped". Twitter.com. Retrieved December 3, 2013. ↑ "Stephen Rodrick". Twitter. Retrieved February 7, 2016. ↑ "Twitter / ESPNMag: Are you ready for some football?". Twitter.com. Retrieved December 3, 2013. ↑ Sam DeHority. "Russell Wilson: The Quarterback That Connects | Men's Fitness". Mensfitness.com. Retrieved August 16, 2014. ↑ "Wednesday Round-Up: Russell Wilson featured on cover of Men's Health". Seattle Seahawks. Retrieved February 7, 2016. ↑ "Eminem "The Monster" Lyrics". Lyricsfreak.com. Retrieved March 18, 2014. ↑ Tony Drovetto (February 4, 2014). "Russell Wilson on the Late Show with David Letterman". Seahawks.com. Retrieved August 16, 2014. ↑ "Seattle Seahawks quarterback Russell Wilson talks on 'Kimmel' - Seattle Seahawks Blog- ESPN". ESPN.com. Retrieved February 7, 2016. ↑ Tony Drovetto (February 26, 2014). "Russell Wilson on Late Night with Seth Meyers, Charlie Rose Show". Seahawks.com. Retrieved August 16, 2014. ↑ Fox Sports (March 16, 2014). "Russell Wilson set to make cameo in Entourage movie | FOX Sports". Msn.foxsports.com. Retrieved August 16, 2014. ↑ "Russell Wilson to Host 2nd Annual Nickelodeon Kids' Choice Sports Awards". Variety. ↑ "Ciara Is Dating Seattle Seahawks Quarterback Russell Wilson and It's Been Constant Laughter and Fun So Far!". E! Online. April 23, 2015. Retrieved February 7, 2016. ↑ Harrison, Lily (July 6, 2016). "Ciara and Russell Wilson Are Married!". E! Online. United States: NBCUniversal. E! Entertainment Television, LLC. Retrieved July 6, 2016. ↑ "Dave Softy Mahler". Twitter. Retrieved February 7, 2016. ↑ Greg Bishop (August 26, 2014). "Inside the close-knit inner circle of Russell Wilson". Retrieved February 7, 2016. ↑ "Russell Wilson on baseball comments: "I didn't say I was going to leave the NFL"". Tacoma News Tribune. Retrieved February 7, 2016. ↑ Jensen, Erin (October 26, 2016). "Ciara and Russell Wilson are expecting a baby". USA Today. United States: Gannett Company . Retrieved October 26, 2016. ↑ Condotta, Bob (April 23, 2014). "Russell Wilson files for divorce | Seahawks Blog | Seattle Times". Blogs.seattletimes.com. Retrieved August 16, 2014. ↑ "The faith and football of Russell Wilson – Blog". MyNorthwest.com. Retrieved January 19, 2013. ↑ "Russell Wilson opens up on presidential election, Colin Kaepernick and more". ↑ Wilson, Russell (September 25, 2012). "Bob and Groz Show". 710 ESPN Seattle (Interview). Interview with Bob Stelton; Dave Grosby. Seattle, Washington: KIRO. Retrieved September 25, 2012. ↑ "Wilson comfortable in Seattle, ready to compete". WRALSportsFan.com. Retrieved January 19, 2013. ↑ "NFL Quarterback Russell Wilson Helps Battle Diabetes" (Press release). French West Vaughan. June 5, 2012. Retrieved August 29, 2012. ↑ "Twitter / RWPassAcademy: The @RWPassAcademy Tours 5". Twitter.com. Retrieved January 19, 2013. ↑ "Russell Wilson and Kasey Kahne Team Up for The Drive". Kasey Kahne Foundation. December 20, 2013. Retrieved August 16, 2014. ↑ "Twitter / KaseyKahneFndn: Awesome! Over $220k donated". Twitter.com. July 10, 2014. Retrieved August 16, 2014. ↑ "Seahawks quarterback Russell Wilson and NASCAR driver Kasey Kahne fight cancer with The DRIVE". Seattle Seahawks. Retrieved February 7, 2016. ↑ "Russell Wilson's Foundation Raises $1 Million for Children's Hospital". August 25, 2016. Wikimedia Commons has media related to Russell Wilson.